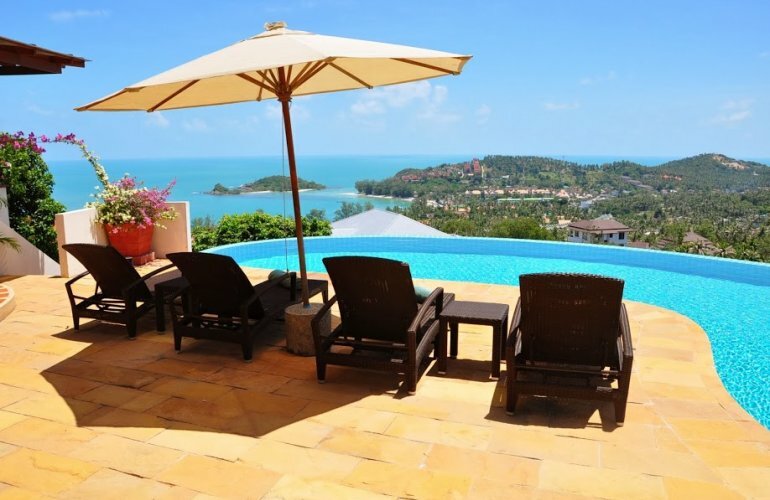 This magnificent villa occupies a dominant hilltop position with commanding views across sprawling coconut plantations towards Choeng Mon Bay and the sparkling Gulf of Thailand beyond. Located in the islands much sought after northeast, it is just ten minutes from the airport and within easy reach of shops, restaurants, beaches and spas. This elegant family home consists of two separate pavilions. In one, a large open plan living room with comfortable sofas and multi-channel flat screen TV/DVD and entertainment system, a fully fitted and equipped Western style kitchen with breakfast bar and stools, and formal dining area for eight guests. A convenient guest washroom is located off the living room. Large sliding picture windows open on to the attractive sun terrace, surrounded with a mass of beautiful bougainvilleas and a huge hardwood table with comfortable seating for eight, two cushioned sun loungers, and a family size gas barbecue. Two double bedrooms are situated below the living room and open directly on to the pool terrace. A second pavilion features the master bedroom on the upper floor and a twin bedroom below with direct access to the pool sunbathing terrace. Three of the tastefully furnished bedrooms have king size double beds, the fourth with large size twin beds. All the bedrooms have fantastic sea views and large modern en suite bathrooms with black slate and glass shower enclosures. The master bathroom features double washbasins and a walk through bathroom to an outside bathroom with rain shower and large mosaic tiled bathtub overlooking the bay at Choeng Mon. All the bedrooms are self-contained with lockable doors. The spacious sandstone sun bathing terrace and stunning 15-metre infinity edge swimming pool have spectacular views of the surrounding tropical landscape and the islands coastline. The pool terrace is equipped with ample sun loungers and for those who prefer the shade, a large sun umbrella and sala beside a natural rock waterfall incorporating a bar, the perfect place to relax with a favourite cocktail and watch the onset of dusk. Beautiful manicured lawns and a profusion of colourful tropical plants and flowers surround the villa. A husband and wife team, Khun Mee and Khun Deng, live unobtrusively in private quarters below the villa and look after the property. They will be pleased to assist in any way possible. The owners may remove some of their more personal possessions when the villa is occupied by paying guests. Due to the number of steps, the villa is unsuitable for younger children.